TORRANCE, Calif.--Enova Systems, Inc. , a leading innovator of proprietary hybrid and electric drive systems propelling the alternative energy industry, today announces the company has been awarded an exclusive supplier contract with the General Services Administration (GSA), which provides vehicles for government agencies and armed forces. The Enova Ze is powered by Enova’s 120kW all-electric drive system and is currently the only zero emissions solution for federal fleets in the step van category. As part of the contract, Enova will supply Enova Ze all-electric walk-in step vans to GSA with a GVWR between 10,001 and 16,000 lbs. for 12, 14, and 16 foot body lengths. GSA, along with all Federal agencies, has been tasked by President Barack Obama in a recent Executive Order to set and meet specific targets for increased energy efficiency, a 30% reduction in fleet petroleum consumption, and reduced emissions by 2020. The Enova Ze’s zero emissions technology has captured the attention of some of the largest commercial OEMs and fleet operators in the world. Recently, Enova has partnered with Freightliner Custom Chassis Corporation (FCCC), to integrate and deploy this innovative technology with the MT-45 walk-in van chassis, with deployment to national fleet operator(s) in the first quarter of 2010. The U.S. Air Force has been evaluating the Ze all-electric drive system for more than 18 months, with positive results. Tom Quinn, the Director for the Hawaii Center for Advanced Transportation Technology (HCATT) says, "The Enova Ze has performed exceptionally well for the U.S. Air Force. The support staff at Hickam Air Force Base have relied on the Ze to deliver outstanding service and quiet performance every day. It certainly has become a valuable addition to their fleet." Ease of use, with none of the maintenance requirements associated with gasoline drive trains. 6 – 8 hour battery charge, achieved via a simple 220 volt outlet. Combined Electronic Drive Motor (EDM), Enova Control Electronics Unit (CEU), and batteries eliminate the need for an internal combustion engine. Ideal application for vehicles with a regular driving route that involves stop-and-go driving conditions. Zero greenhouse gas emissions, making it an ideal candidate for government and commercial fleets looking to reduce their carbon footprints. In related news, Enova lauded Smith Electric Vehicles’ (“Smith”) recent GSA announcement of the Smith Newton product offering in the Medium and Heavy Duty Vans category with a GVWR of 25,500 lbs. The Smith Newton is an exclusive, all-electric medium and heavy duty truck offering on the GSA product menu. 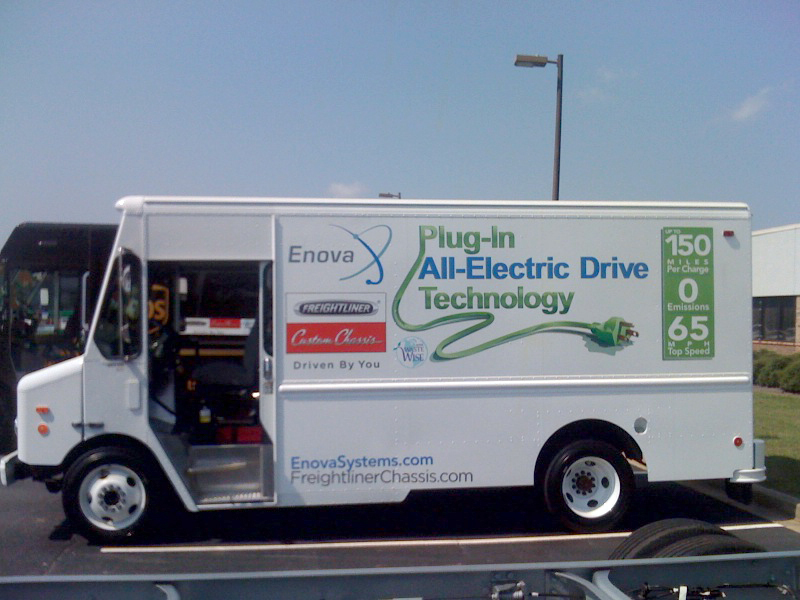 Enova Systems is fulfilling orders of its drive system to Smith Electric Vehicles for both the UK and US initiatives, with shipments scheduled in 2010 in anticipation of orders for the Smith Newton. Navistar continued to demonstrate its leadership in the American school bus market with its exclusive GSA contract to supply hybrid school buses. Enova is the exclusive supplier of hybrid electric drive systems to IC Bus, an affiliated division of Navistar. The Enova post-transmission hybrid drive technology couples a diesel engine with an 80 kW drive train that incorporates a control unit, a Li-ion battery pack and an electric motor. “To achieve multi vehicle recognition from the GSA affirms Enova’s market leadership in the clean vehicle space. Such recognition will allow us to further expand the penetration of our drive system technology into government fleets as they consider their options in meeting President Obama’s order.” concluded Staran. For further information, contact the Enova Systems GSA Hotline directly at (310) 527-2800 ext. 135. The U.S. General Services Administration (GSA) is a mandatory source for vehicles under Federal Property Management Regulation 101-26.501 that purchases vehicles at a savings from the manufacturer's list price. Purchasing at savings guarantees that government agencies receive the best value at the lowest possible price without having to go through a tedious bid process. For more information, visit www.gsa.gov. Freightliner Custom Chassis Corporation manufactures premium chassis for the motor-home, delivery walk-in van, and school bus and shuttle bus markets. Freightliner Custom Chassis Corporation is a subsidiary of Daimler Trucks North America LLC, a Daimler company. For more information, visit www.freightlinerchassis.com.